Can’t get enough Dara Puspita….here’s more. After a few CD reissues on the wonderful Sublime Frequencies label, Dara Puspita (which translates to the Flower Girls) get the “best of” treatment. Since the early original LP’s of theirs are basically extinct, Groovie Records took it upon themselves to select some of Dara Puspita’s classics from all of their albums and put them back on vinyl. If you’ve never heard of or listened to the sensations of 60’s Indonesia, this would be a wonderful time and place to start. This is definitely a record you need to listen to…. So we are timewarpin it to the 1960’s and are stopping by the early “demented” garage R&B/Pop/Punk scene. Gold is to be found here on this album (especially “My Life” by Thor’s Hammer and “Moonshine” by The Marksmen). Booze will magically appear if you play this album extremely loud. It also a great introduction to many underrated bands that lived in the shadow of big names like the Stones and the Zombies. 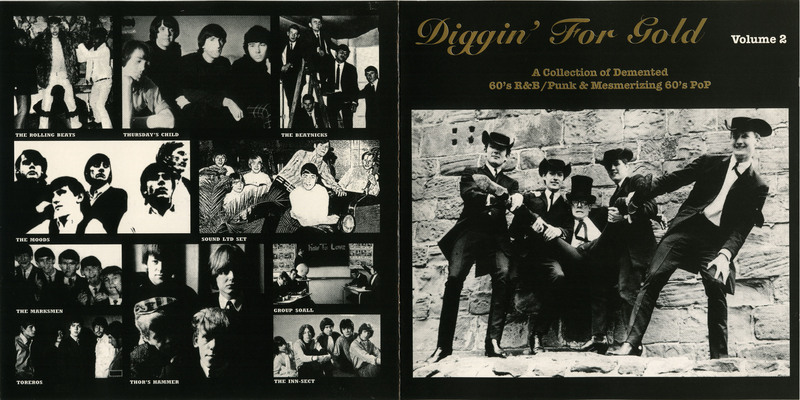 Another compilation of golden pleasures from the Diggin for Gold series. So whens the next acid party? Reminder: If you missed out on last years blog hype of Dara Puspita…pick this up NOW! Around this time last year this Indonesian girl group from the 60’s was all the rage in the blog world. Perfect for summer and with the recent flood of “girl bands”, the resurfacing of Dara Puspita made perfect sense. I’m not sure if this is the whole album, but these 8 tracks are flawless examples of 60’s garage soul. 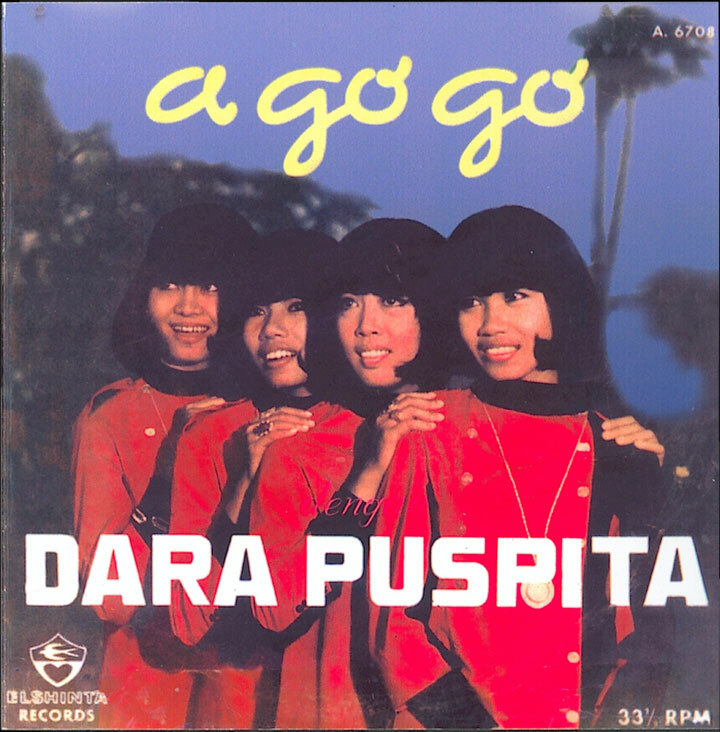 Dara Puspita (Flower Girls) was Indonesia’s most successful girl band of the 1960s. While there were many popular female vocalists in Indonesia at that time, they nearly all relied on the services of a backing band. Dara Puspita was one of the few girl groups who actually played all their own music as well….they also had a reputation as a sensational live act, bashing away on their instruments, screaming out their songs and jumping up and down. Even though it was often hard to hear the songs through all the mayhem, audiences thought it was great and often joined the band to dance around on the stage. 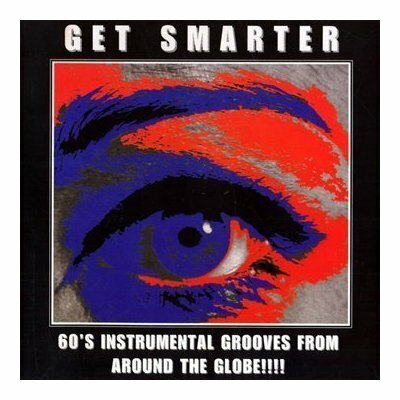 GET SMARTER: 60’s Instrumental Grooves from around the Globe!!! Fun little mix of campy 60’s psychy instrumentals perfect for the midnight hour. Straight up mod organ bangers. This is definitely one for you crate-diggers and lovers of 60’s psych soundtracks from cult classics. It is diverse in the sense that the songs come from many different countries, but all the songs do have a similar TV-show-theme feel to them. Fast, upbeat; these fuzzed out nuggets aim to aim to get those smokey dancefloors shakin. Be sure to check out the tracks “Sleppin” and of course “Here Comes the Boat” which is like some sort of drunken 60’s fantasia. There really isn’t a better way to describe this super cool mix! Here’s 18 superb specimens from the ever-so-slightly weird & wild side of the 60’s: freaky go-go phased Hammond wig-outs, groovy party rave-ups, trippy psych weirdness and laid back lounge influenced funky pop jazz…. Josh here….So I haven’t been doing my part in updating the blog for about 3 weeks and it’s time for me to start pickin up my slack. Thumbs up to Mike for keepin up the blog and let’s not forget J Bogus for his help keepin things moving as well. I took a trip to NYC (1st time visitor) and roamed around for week going to shows and galleries…seein the sights. Went to the amazing Other Music and picked up a few items, some of which will make an appearence on the blog this coming week. And for Round 1, I present you with this rockin’ compilation of all-girl garage bands. The 60’s garage sound is perfect for this pre-Summer season…..ahhh Sunshine Time, “You Turned My Head Around” was reason enough for me to purchase this comp. 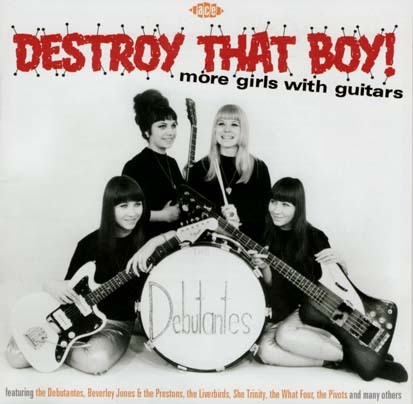 “DESTROY THAT BOY!” is the sequel to our “Girls With Guitars” collection of 2004. As with its preecessor, the focus is on all-girl bands of the 60’s – greet New York’s very chic What Four, the guitar-wielding She Trinity, Merseyside’s very own “female Beatles” the Liverbirds, the rockin’ Debutantes and the Feminine Complex – and female groups and soloists who recorded in the required “garage girl” style, but this time with more of an internantional flavour. And yes, that the THE Ann-Margret’s name you see on the track list.